special ligaments connect the Atlas and the Axis, allowing for flexibility and strength. Thickening or deterioration of these ligaments can, therefore, lead to stiffness, hypermobility, neck pain, and chronic neck problems. The majority of the cervical vertebrae (C3-C6) share similar anatomical characteristics in that they each have a bony process, called the pedicle, on either side of the vertebral body which supports the protective arch covering the spinal canal and, within it, the spinal cord. The laminae provide extra protection for the spinal cord at the posterior of the bony arch of the vertebrae and are thinner, and narrower, above than below. The pedicles are attached to the vertebral body midway between its top and bottom edges in such a fashion that the superior vertebral notch is narrower, but just as deep, as the inferior vertebral notch. 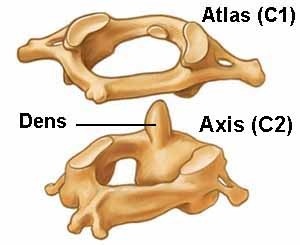 These cervical vertebrae are wider than they are deep and have flattened anterior and posterior surfaces with the anterior edge projecting downward in order to overlap the vertebra below. The articular processes are fused in the cervical vertebrae, forming articular pillars from the joint of the pedicle and lamina. The lowest cervical vertebra is C7 (also referred to as the vertebra prominens) and it differs from all of the others above it in that it has a much longer and more prominent spinous process which, in some people, may be connected to a pair of cervical ribs. These cervical ribs are considered an abnormality and can become problematic due to their impact on the space in the cervical region. Muscles and ligaments connecting the cervical ribs to the other ribs and the vertebrae cause further compression in this area and may be connected to thoracic outlet syndrome and problems with the brachial plexus. Subclavian artery compression, and nerve compression may lead to ischaemic muscle pain (as circulation is reduced to the muscles or cut off), numbness and weakness in the shoulders, arms and hands, and radicular pain. Raising the arms often exacerbates this compression in the presence of cervical ribs and may trigger symptoms.